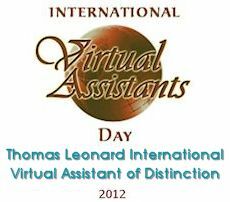 Thomas Leonard International Virtual Assistant of Distinction Award for 2012. “I am truly honoured and humbled to be the recipient of the Thomas Leonard International Virtual Assistant of Distinction award. It is a milestone in my career that I will never forget. I am blessed to walk in the path of the other VAs before me that have won this award and hope I am inspirational to those in the future who will one day also be recognized for their contribution to the VA industry. For more information, please feel free to contact Janice directly.